Now that you’ve made the decision to hire a Veteran, how do you find them? One of the key skills the military teaches you is “how to hide” – yourself, your equipment, buildings, etc. There is a reason we have stealth aircraft flying at supersonic speeds, attack subs hundreds of feet under the ocean and often wear clothing that blends into trees and bushes. These skills are imperative to helping us survive and ultimately come home. Many people assume that thanks to these skills, Veterans tend to blend into the field of potential hires for an organization. It’s like we are hiding. Not true. The reason we blend in with the rest of the population is that we are just as diverse as our country and we truly represent the nation we served – and that’s how it should be. This is also why it can be very difficult to find us. We don’t have a big V for Veteran tattooed on our foreheads. Many of us just melt into the crowd and unless we run across another Vet (we often can pick up on small little details that give it away), we typically don’t identify our status. So then, how do you as an employer find us? I’m asked this question more and more lately, as companies realize that Veterans make fantastic additions to their workforce. Aside from hiring vets as a way to say thanks or to claim Work Opportunity Tax Credits, employers have found that Veterans make some of the best employees one could ask for. Veterans are well regarded for their work ethic, professionalism, loyalty and can-do attitude. This makes them attractive employees. In fact, these are the real reasons companies want them. But where can you find them? Create a group for Veteran employees within your company: Many companies call them Employee Veteran Resource Groups (EVRG). It may be formal or informal, but these are groups that come together and share ideas, talk about transition and usually get involved in some community support activities. Provide military culture training to your managers and hiring staff so they have a basic understanding of what military service is like and what skills military personnel possess – local Vet organizations or the VA can assist with this at no cost. Learn to look beyond MOS: One’s Military Occupational Skill is essentially their job position within the military. The problem is the MOS doesn’t cover all the training and outside responsibilities – Soft Skills. This ignores the personnel, project and financial management responsibilities a service member has also acquired. Create a Veteran-focused webpage: Tied into creating a Veteran-supportive environment is to creating a page on your web site expressing your appreciation for Veterans’ service and encouraging them apply to positions within your organization. Mention that you look beyond MOS and want their leadership, program and project management skills in your organization. 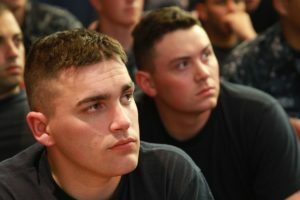 Team up with colleges/universities in the area: The GI Bill has allowed a huge number of service members to advance their education following their service, and schools are always looking for ways to help students succeed upon graduation. These are not just universities and colleges but many skill-specific trade schools or training programs. Learning institutions probably have a office of Veteran Services you can contact, and if not, check with their career centers or individual departments. Also, most schools now have a student Veteran organization. Team up with them to offer classes on your industry, job-searching tips or even hold networking events. Host or participate in an industry event: Veterans, like most people, want to learn more about your industry. A great way to reach Veterans is to team up with your local business association or Chamber of Commerce or tie into civic associations you may already be a part of such as the Rotary Club or Elks. Tailoring your presentation towards Veterans can give these organizations some great topics to address and expand their desire to provide meaningful content to their members. In order to maximize the event, partner with several other member organizations to offer panels specifically focused on hiring Veterans. Once you organize the event, spread the word to local colleges and universities to attract a large audience. Work with local Veteran service organizations and business associations: Get involved with a Veteran organization in the community and participate in their various causes. This could be your local VFW or American Legion chapter or possibly Team Red, White and Blue or The Mission Continues. These groups are involved in Veteran and Memorial Day parades, putting flags at Veterans’ headstones or even helping your HR staff conduct employment workshops. Tie in to your local Veterans Affairs office: Despite the bad rap that many associate with the VA, it is truly an organization that is steadfast in its commitment to Veterans, and they have some great programs to help transitioning Veterans of all ages to gain civilian employment. They even have a portion of their website dedicated to companies who want to hire Veterans. Get involved with ESGR: ESGR – Employer Support of the Guard and Reserves – is a Department of Defense Office which promotes cooperation and understanding between employers and members of the guard and reserves. They also recognize organizations providing excellent support to their hires within these military components. In recent years, ESGR has taken a leadership role on employment efforts for all Veterans. 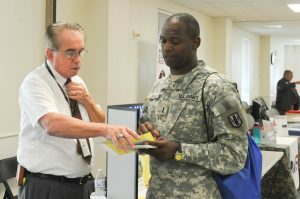 Among other services, they offer Military and Veteran Employment Expo which include two days of job search classes, followed by a full-day job fair. 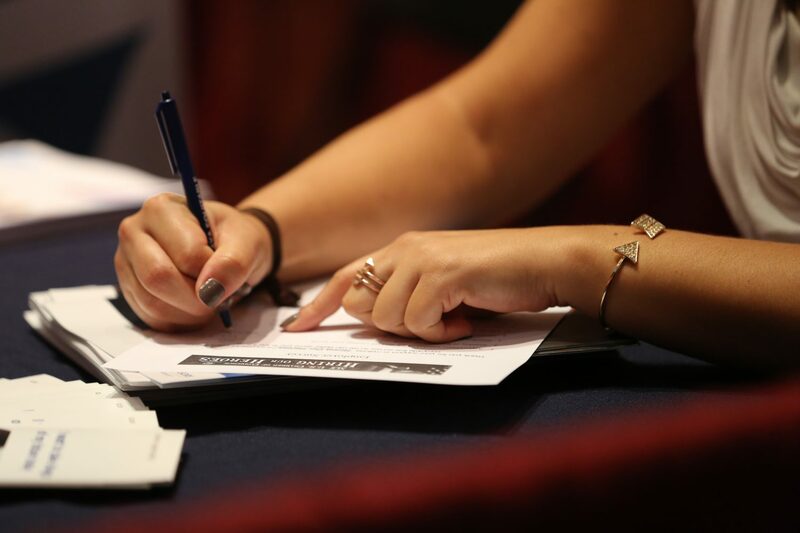 Unlike other hiring fairs, these are free to employers. Contact your state ESGR to find out more information. Leverage social media: Social media is not only a good place to advertise positions. It’s also an opportune place to demonstrate some of your company’s Veteran-supportive efforts. When your company volunteers with a Veteran organization, post photos on Facebook, LinkedIn and Instagram. If you have a seminar on military culture for your key managers and HR staff, mention it a blog post. Sgt. 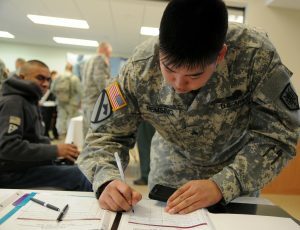 Guaiza S. Hemsing, native of Guam, assigned to the Warrior Transition Battalion, Joint Base Lewis-McChord, Wash., signs up to tour a federal agency offering internships to wounded warriors on April 24 at the Operation Warfighter Internship Fair. Connect with military installations: While this may be a no-brainer, it can initially seem a bit daunting. However, large installations have an office that focuses on career skills and transition assistance for soon-to-be-separating service members. The staff at these offices will be more than happy to hear about open positions in your company and help match you with good candidates. Additionally, the USO—which is well known for providing entertainment and support for service members—is assisting in this effort through their RP/6 program and would be thrilled to assist you. Once you hire a Vet, leverage their connections: We Veterans often find one another and we all have networks –formal and informal – which you can tie into. Encourage hired Veterans to spread the word that you are looking to hire more Vets. Word of mouth is a powerful force in the Veteran community, so don’t be shy in asking Vets to connect you with their contacts. These are just a few things you can do to find the diverse group and the men and women Veterans within our nation’s job-seeking population. But once you find and hire a Veteran that has served our country, I have no doubt they will prove to be great assets to your organization. Do you need assistance locating and engaging veteran talent? Get in touch with us, we’d love to help.